What is the most important information I should know about sevelamer? You should not take this medicine if you have a bowel obstruction. Sevelamer is a phosphate binder. Sevelamer helps prevent hypocalcemia (low levels of calcium in the body) caused by elevated phosphorus. 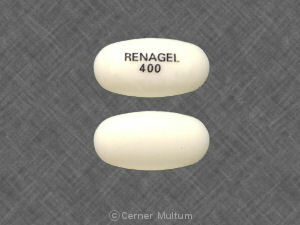 Sevelamer is used to control phosphorus levels in people with chronic kidney disease who are on dialysis. 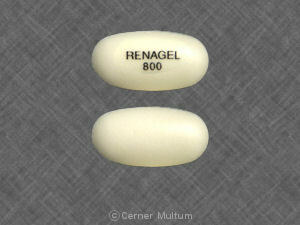 Sevelamer may also be used for purposes not listed in this medication guide. What should I discuss with my healthcare provider before taking sevelamer? You should not take sevelamer if you are allergic to it, or if you have a bowel obstruction. Taking sevelamer while you are pregnant can lower your blood levels of certain vitamins or folic acid. Follow your doctor's instructions about taking vitamins or mineral supplements during pregnancy. Because sevelamer is not absorbed into the bloodstream, it is not expected to be harmful to a nursing baby. Sevelamer is not approved for use by anyone younger than 6 years old. How should I take sevelamer? Sevelamer powder must be dissolved in water before you take it. The 0.8-gram packet should be mixed with at least 1 ounce (2 tablespoons) of water. The 2.4-gram packet should be mixed with at least 2 ounces (4 tablespoons) of water. Stir the powder in water until it is completely dissolved. Stir and drink this mixture right away. To get the entire dose, add a little more water to the same glass, swirl gently and drink right away. While using sevelamer, you may need frequent blood tests. Call your doctor if you have have trouble swallowing the tablet, or if it feels like it gets stuck in your esophagus after you swallow it. Sevelamer may be only part of a complete program of treatment that also includes a special diet. It is very important to follow the diet plan created for you by your doctor or nutrition counselor. You should become very familiar with the list of foods you must eat or avoid to help control your condition. Take the missed dose as soon as you remember. Be sure to take the missed dose with food. Skip the missed dose if it is almost time for your next scheduled dose. Do not take extra medicine to make up the missed dose. What should I avoid while taking sevelamer? mycophenolate mofetil (CellCept) should be taken at least 2 hours before you take sevelamer. What are the possible side effects of sevelamer? constipation that gets worse or does not clear up. What other drugs will affect sevelamer? Other drugs may interact with sevelamer, including prescription and over-the-counter medicines, vitamins, and herbal products. Tell each of your health care providers about all medicines you use now and any medicine you start or stop using. Your pharmacist can provide more information about sevelamer. Copyright 1996-2017 Cerner Multum, Inc. Version: 10.02. Revision date: 12/7/2016.